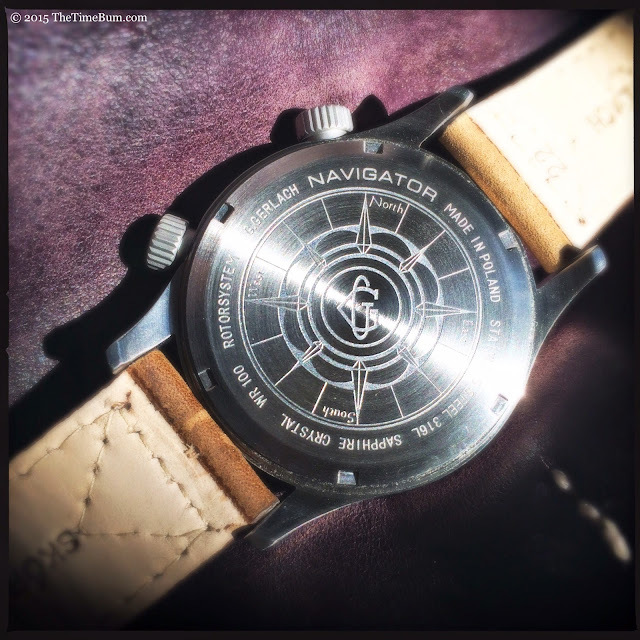 I was chatting with a fellow watch nerd about our recent acquisitions, and I proudly showed him the G. Gerlach Navigator I was preparing to review. He was not familiar with the brand, so I explained that they are a Polish watchmaker with several models under their belt. He raised his eyebrows. "There is a micro brand in Poland?" It was not the first time I had encountered that reaction, nor would it be the last. Everyone is curious about this watch, simply because they don't associate watches with that country. That changes when they get their hands on the Navigator, a handsome watch with a compressor style case, Seiko NH35 automatic movement, 100 meters water resistance, and an anti-reflective sapphire crystal. The watch has much to offer, and is part of a larger mission to renew innovation in Polish industry. If you follow me on Instagram, you know that I am also a Wine Bum. I'm hardly a full-fledged oenophile, but unsurprisingly, I do enjoy finding nice wines at bargain prices. Wine nerds have a somewhat nebulous concept called terroir, defined as a sense of place manifested in the wine. It comes from environmental properties such as climate, mineral content, and topography. Whether it is science or poetry is a matter of some debate, but I find the idea appealing. Obviously, there can be no true terroir in an artificial item like watch, but we have all experienced the personalities of machines, and right or wrong, we tend to associate them with their place of origin. It is a bit of fiction when you think about it, particularly considering that the vast majority of watches are actually constructed far from their home countries, but it remains a powerful notion nonetheless. [T]he promotion of a country is most effective by associating products with the given country. The more innovative, advanced, and good looking the product is, the stronger the association with the country it was made in. IKEA, Lego, Nokia, Mercedes-Benz, Sony — those keywords describe not only companies, but also the countries of their origin. To this end, they aim to revitalize creativity and innovation in Polish engineering and design - starting with their watches, which are inspired by the country's industrial achievements including sailing ships, submarines, aircraft, automobiles, and motorcycles. Indeed, browsing the product page is a thumbnail history lesson. The Navigator fits neatly into this scheme, given the original G. Gerlach's production of precision equipment. The association is underscored by the engraved compass design that decorates its case back. The Navigator's stainless steel case has the athletic build one expects in a modern tool watch, measuring 42mm across, 51mm long, and 13mm thick. It is not overly large, but the vertical sides and brushed finish give it a burly look. Like the iconic Longines Super Compressor, it has crowns at 2 and 4 o'clock. On this watch, they are large, coin edged, and sandblasted. Both are decorated; the upper crown has "Navigator" engraved around its perimeter, and the lower bears the double G logo. The upper crown operates the internal bezel, and rotates smoothly. The lower is a push-pull that sets the movement. The polished outer bezel is concave, creating three distinct reflective surfaces when viewed straight on. 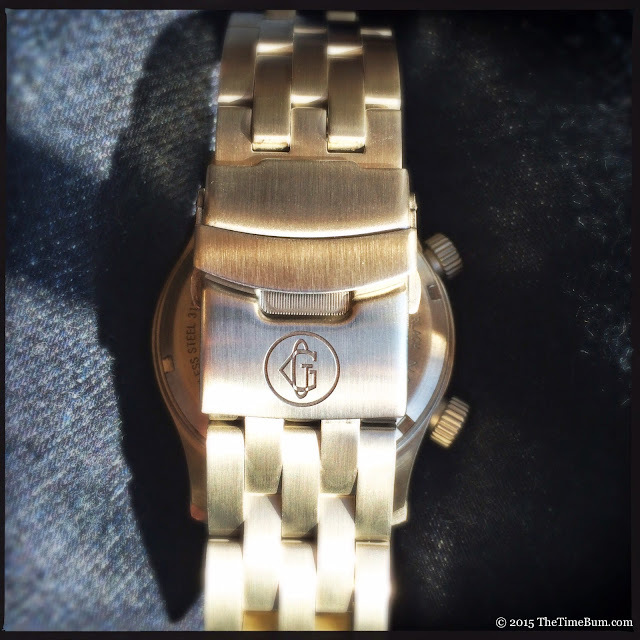 It is an unconventional design choice that adds to the character of the watch. The lugs are tapered and curved, with 22mm between them. While the overall case quality is very good, I did take exception to the finishing of the lugs. The inner edges are sharp – not just "clearly defined" sharp, but more like "be careful when you touch that" sharp. They don't contact your wrist, but they are disappointingly unfinished. Inside the case beats a Time Module (Seiko) NH35a. This 24 jewel automatic movement hums along at 21.6k bph. It hacks, hand winds, and has a power reserve of over 40 hours. This same movement powers several watches in my collection, so I anticipate this one to be every bit as reliable and accurate. 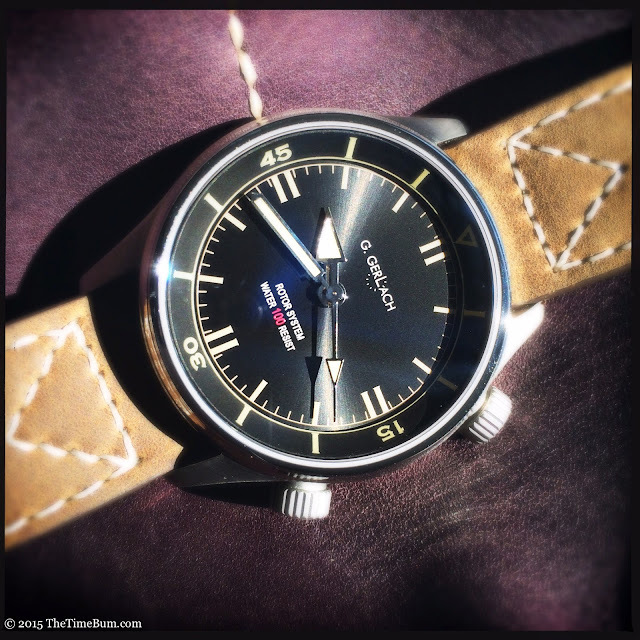 As I have come to expect from these a Seiko automatics, it is a quiet movement. You can hear the rotor if you really listen, but it never intrudes. 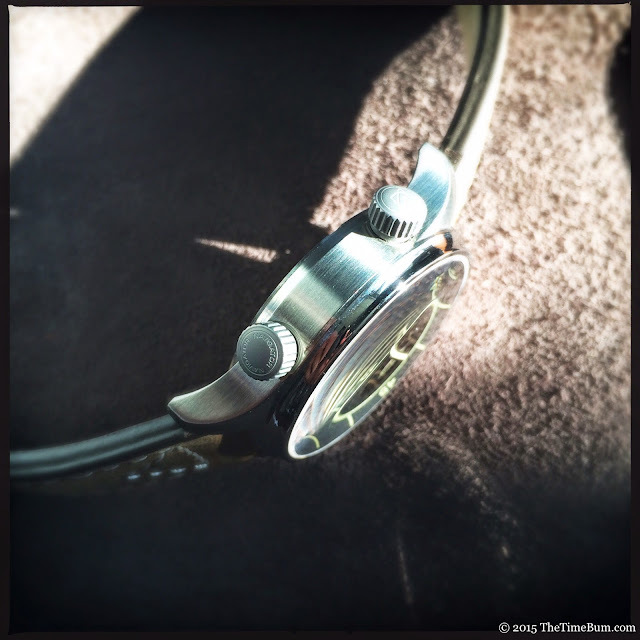 The watch has a black sunburst dial with tan lume on the markers and hands. The numerals on the inner bezel are printed in a bold, serif font; all other markers and indices are bars. The second hand and hour hand sport broad arrowheads. Text is minimal and printed in white save for the red "100." 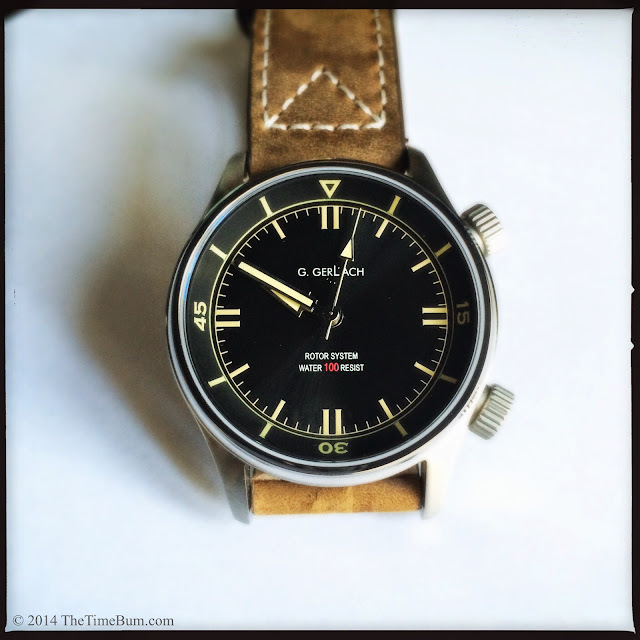 It is a clean, modern look that is nicely mellowed by the vintage effect of the tan lume. I was drawn in by this dial from the moment I saw the initial renderings over a year ago, and I can report that it is just as impressive in person. You can order the Navigator with a 4:30 date window, but I prefer the dial uninterrupted. Night visibility is excellent. 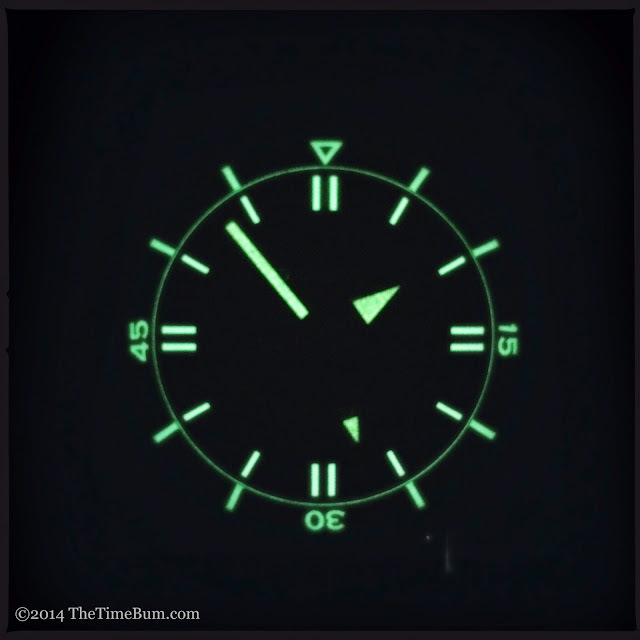 The hands, markers, and bezel all light up with a bright green glow. Strap options include thick brown leather, olive green canvas, and a solid link bracelet. I ordered the leather and the bracelet. The bracelet is 22mm wide and does not taper. Links are solid with a brushed finish. It secures with a signed, flip lock diver's clasp. I knocked out four links and it fit my 6.5" wrist very well after cinched it in with a couple micro adjustments on the clasp. It is a quality bracelet, sturdy and comfortable. The links are a bit tight when you first wear it, making the whole thing a bit stiff, but it should loosen up with wear. I was skeptical of the straight end links at first because I have found that on many watches they leave an unsightly gap. This was not the case on the Navigator. The straight ends are close to the case, which is beveled between the lugs for clearance. I like the solid look of the bracelet, but I don't think it is the best option for the watch. 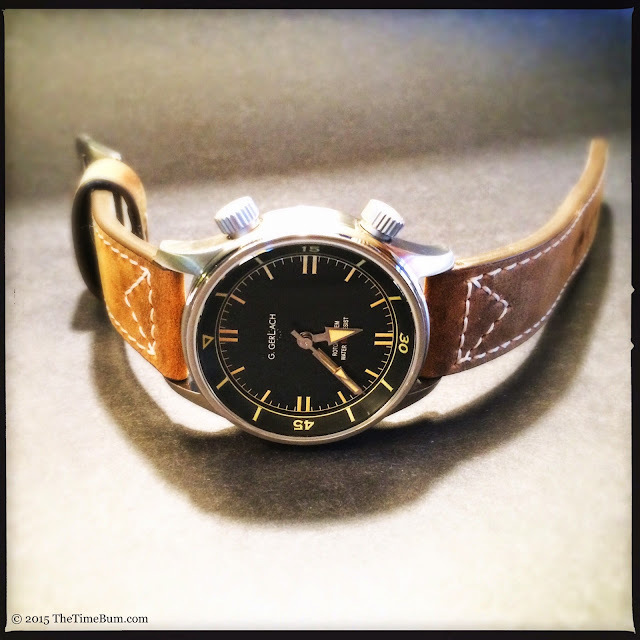 The thick brown leather strap is a much better complement to the tan markers on the dial. The buckle resembles a smaller, rounder version of a Panerai, and balances well with the case. 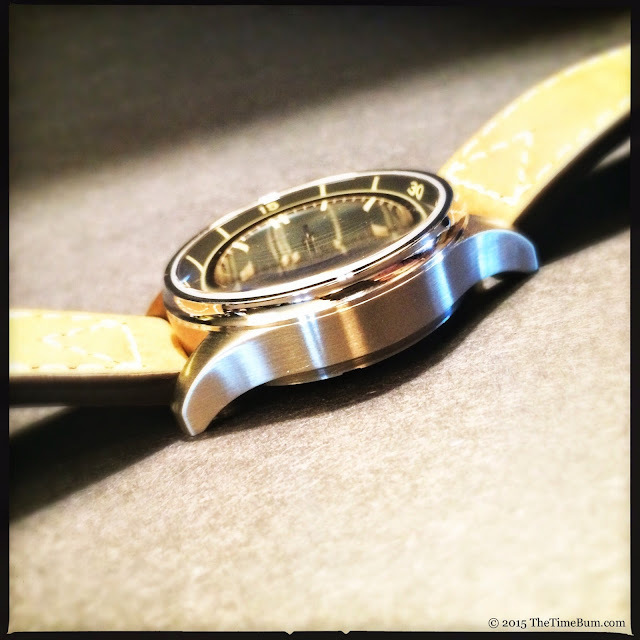 I didn't order the canvas strap, but the green color would also work well with the warm tones in the dial. I found the bracelet to be too cold against the dial for my tastes, but it only adds 140zl ($38 USD) to the cost of the watch. For that price, there is really no reason not to give it a try yourself. 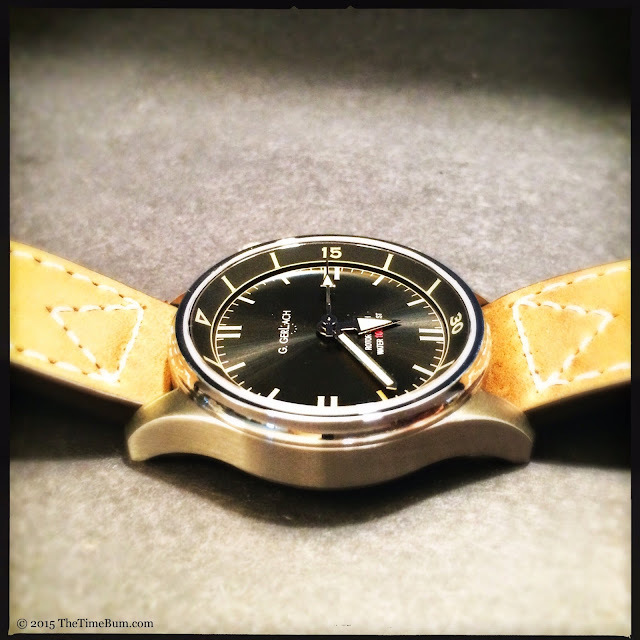 Speaking of price, the Navigator lists for 1399zl ($385 USD) on the standard leather strap. I'd say it is well worth the money. 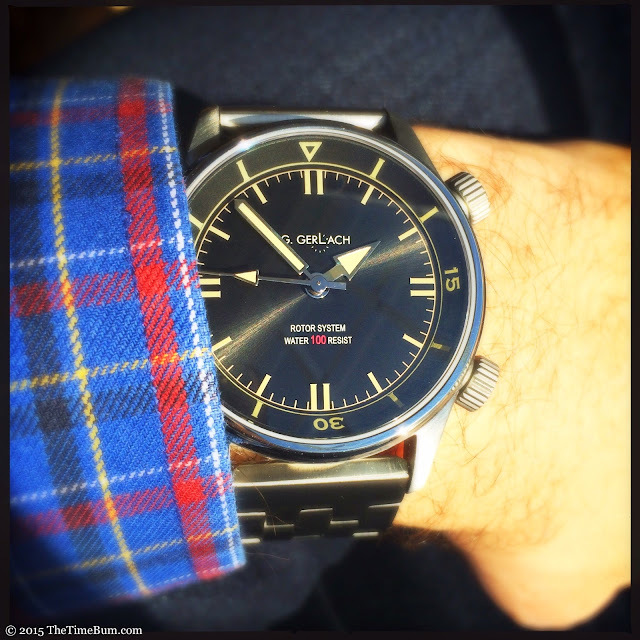 The specs are spot-on, and like other G. Gerlach watches, it deftly marries classic style with a modern aesthetic. I am thoroughly enjoying my Navigator, and I suspect you will too. Pro: Lovely dial, slick bezels. Con: Rough between the lugs. Sum: If this is the future of Polish design, you can count me in. The Time Bum approves.